NEW YORK (NYTIMES) - A short man in a beige button-down shirt emblazoned with the New York City health department logo walked through the doors of a restaurant kitchen, detected signs of vermin and called over the owner to tell him the bad news. The restaurateur started shaking and sweating. He fell out of his chair, hit the floor and lost consciousness. An ambulance was called. The most feared and loathed character in the city’s restaurant business is not the critic, or the landlord. It’s the health inspector. New York’s inspectors have long been capable of showing up unannounced, recording violations and, if necessary, shutting down a kitchen. But in 2010, they acquired a new dimension of power: the ability to assign letter grades (printed on placards that must be visible from the street) and to post their findings in an online database where anyone can scrutinise a restaurant’s inspection history. 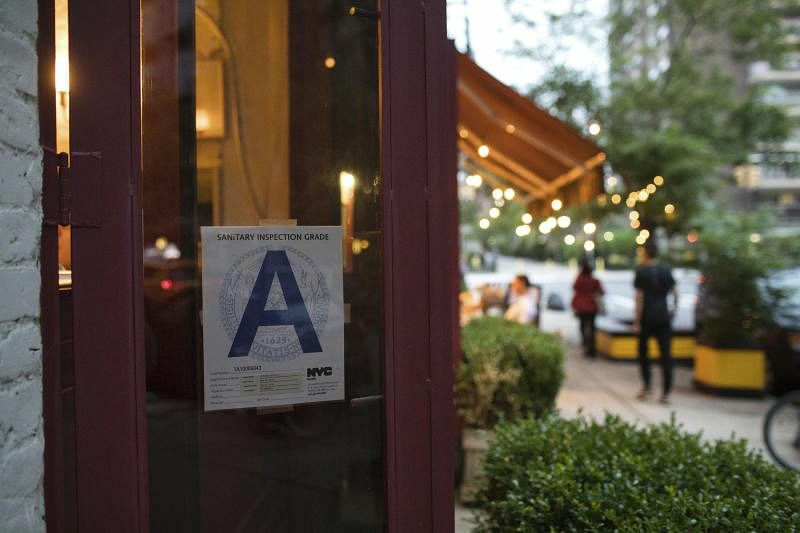 Restaurateurs complained bitterly about the “scarlet letters,” and what they saw as punitive enforcement aimed at raising money for the city. Eight years on, that furor has cooled. The number of restaurants with an A grade rose to 93 per cent in April, from 81 per cent in that first year. Yet many restaurateurs still feel aggrieved about the rating system; they talk of the health inspectors as arbitrary, unjust – and frightening enough to send an owner to the hospital with a panic attack. As it turns out, the man in beige who precipitated that crisis is a pleasant, even-keeled individual named Fayick Suleman, who lives in the Bronx with his wife and two children, and – like the letter-grading system – is celebrating his eighth anniversary at the Department of Health and Mental Hygiene. There are now about 100 restaurant inspectors. His experience shows how the inspector’s job works, and how much it has changed, or has not. He says his rounds have become fairly routine – at least for him. The sight of his distinctive black Casio G’zOne flip phone, the kind issued to inspectors, often sends restaurant staffs into a panic, even when Mr Suleman goes as a civilian. Mr Suleman grew up in Kumasi, a city in Ghana. He left in 2002, came to New York and studied biochemistry at Hunter College, hoping to become a brain surgeon. But after the financial downturn in 2008, he realized that, with a family to support, he needed a more immediate source of income. One day, he met a health inspector at the lab where he worked. “And clostridium botulinum leads to … ?” asked Ms Meena Wheeler-Rivera, the instructor and a former health inspector for city swimming pools and saunas. Ms Wheeler-Rivera knows so much that she rarely eats out anymore. Mr Suleman still patronises restaurants, but the potential life-or-death consequences of not writing up a violation are ingrained in him. Mr Suleman conducts three or four inspections a day, on average, normally working from 9 am until 5 pm, or from 3 to 11 pm — though a nightclub inspection, say, could keep him out as late as 3am. Inspections can take as little as an hour (a perfect score — zero, for no violations — is possible), or several hours if food-safety conditions are poor. Mr Suleman has to finish one visit before he can start the next; this means that, contrary to the widespread belief that inspectors deliberately show up during peak hours, he has little control over what time he arrives. Life on the job is lonely. Mr Suleman travels around the city by himself, carrying a backpack with about 18kg of equipment: a Panasonic tablet for typing up reports, a portable Brother printer that allows him to deliver his findings on the spot, two kinds of probes for testing air and food temperatures, alcohol pads for sanitizing the probes, a small flashlight, various types of tags for marking and embargoing food and equipment, and the most important tools of all: the letter grades, printed on thick card stock. Before the grades, when inspection results were not as public, restaurants had little incentive to to address health violations, said Ms Christine Testa, who left her job as an assistant director of the health department in 2011 to become president of Early Warning Food Service Solutions, which trains restaurants on food safety. But even with the A, Mr Adelson said he ended up paying about US$600 (S$800) in fines, which are imposed by the office. These penalties — which can range from a few hundred to a few thousand dollars — and other expenses end up being more financially burdensome than helpful in improving operations, he said. Mr Wilson Tang, the owner of Nom Wah Tea Parlor, in Chinatown, said that while the fairness of inspections has improved over all, “we look at reports and on one, they picked up those couple of things, and the next inspection is completely different”. “If the inspector had a great day, cool, they are typically nicer and more lenient,” he said. But others “had a chip on their shoulder and rushed into the kitchen like there was something going on”. Mr Tang also owns a restaurant in Philadelphia, where “it’s almost laughable how much more lax it is”, he said. The Magnolia Bakery branch in the Bloomingdale’s flagship store in Midtown chalks up the B grade it received last year to the subjectivity of the inspections. Employees had left scoops in food containers — a potential cross-contamination risk — and the inspector could have penalised the shop only once, but instead chose to record an individual violation for each misplaced scoop, said Mr Bobbie Lloyd, a partner and the executive vice president of operations at Magnolia. Ms Corinne Schiff, the city’s deputy commissioner of environmental health, said there were a number of measures to ensure that restaurants were judged objectively and on the same scale, including an exacting reporting protocol for inspectors to follow, and the random assignments. But the health department still clearly feels the tension that hovers over the process. It would not let a reporter trail Mr Suleman during his inspections, and limited his interview time. Mr Suleman would not allow his face to be shown in photographs, and was reticent about some details, including his age and his exact salary; the job pays between US$42,500 and about US$76,000 a year, the department said. Mr Suleman often feels frustrated by the perception that inspectors are out to punish restaurants. “I’m not all-powerful,” he said. “The power is in the hands of the restaurants” to improve their food safety. For him, the most memorable depiction of a health inspector in pop culture is in the 2003 movie, Deliver Us From Eva, a modern adaptation of The Taming Of The Shrew, starring Gabrielle Union as a ruthless health inspector. “She’s screaming at people, and taunting people,” he said.